The All-on-4® Dental Implant-Supported Denture has helped hundreds of thousands of people improve their quality of life. We’re proud to offer the All-on-4 implant-supported denture to our patients in Annandale, Manassas and Woodbridge. The technique uses four dental implants to securely attach a complete denture to the top or bottom of the mouth. This eliminates the slipping and shifting that can happen with traditional dentures that are not secured in place by dental implants. 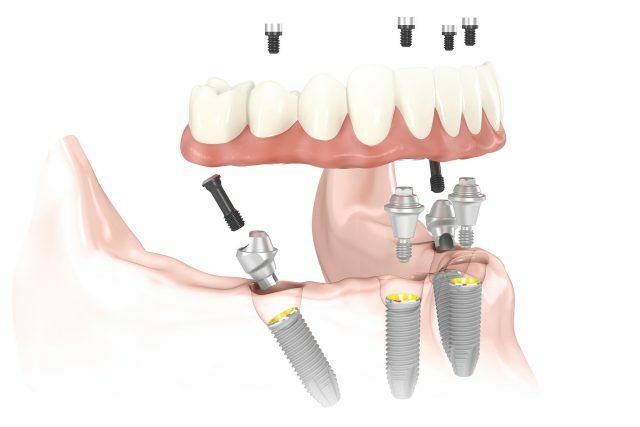 The All-on-4 Dental Implant treatment system permanently attaches the denture in the mouth. The denture looks and functions like natural teeth. It’s easy to bite and chew all of your favorite foods, including steak, nuts, and candy. You can laugh, sing, talk and even sneeze without fear of the denture coming loose. Plus, the All-on-4 implant-supported denture improves your facial appearance. The dental implants mimic natural tooth roots, so they prevent the recession of the jaw bone and the deterioration of the facial structure that usually occurs with missing teeth. Having fewer wrinkles is just one benefit of the All-on-4 denture technique. Our All-on-4 dental implant specialists will perform an oral examination and take the necessary x-rays to determine if you are a candidate for the procedure. If you are, then our team will make molds (impressions) of your upper and lower jaws. These are used to create a custom-fit denture for you. On the day of the dental implant placement, you will comfortably sedated so you don’t experience any anxiety, pain or discomfort during the treatment.